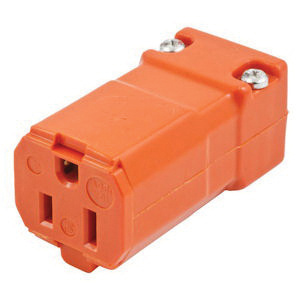 Hubbell-Wiring Valise® Straight blade connector has hinged 1-piece body design for easy assembly. It has assembly screws that are captive and will not fall out while wiring. The powerful, offsetting cord grips clamp on individual conductors. The blade connector consists of plated steel assembly screws, PPO cable inserts, brass terminal screws and nickel-plated steel terminal clamp. Straight blade connector meets UL listed to UL498 file E1706, CSA certified to C22.2 No. 42 File 280 standards.